Does Mr Lottery Really Work? Read 2 Reviews! Mr Lottery claims he specializes in picking the Pick 3 and Pick 4 lottery numbers for any state. 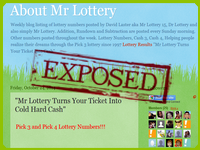 Mr Lottery System Exposed — A New Twist in the World of Lottery! What In The World Is This?! Now what surprises me is that Mr Lottery System has been available since 1997, how come it isn’t as popular as other lottery software? Maybe the guy wants to keep things simple, or perhaps none of the tickets were turned into cash! !!! Big Money!!! Big Money!!! Seriously, What Is It About? This means that he is charging for these services, so they’re not FREE, I repeat they’re not FREE! My question is that how can you claim that you strive for 100% customer satisfaction when you don’t provide any information at all about yourself or the kind of cost you charge? Now, remember shallow waters are always deep. If you want to try a product, what it is that you check for first? Reviews. If there are no reviews, then you see if the price is small enough not to matter, what if there’s no price? What kind of customer service can you expect from a business that doesn’t disclose important information like the details about the creator or system, the case studies of people who used it, testimonials and price? In my experience, chuck this and move on. You might want to give it a try, but I’m sure that it’s not going to work because it just won’t. He is a con artist and a liar and I have the emails to prove it. He will not challenge me on this because David Laster aka Mr. Lottery knows that I have the truth in my emails. Similar to my comment above. The good thing about this all is that I can play my own numbers!!! I really do not like giving out numbers! It is really not worth the headaches! So people are very stupid when it comes to playing the lottery and if I am spending that time tracking my system and not spending that time dealing all the different personality is time well spent! I goo down through the years site the many time that I help my thousand of lottery players win money. I know that if you really take my book a follow the instructions that I give you can win lots of money. It is easy for those that have not studied my system or seem my system to criticize me and my system. These people are the naysayers that attack any and everybody because he lives very small and unhappy lives! I noted the date on the article and yakkety back and forth and couldn’t resist going in to see what the site was like. Are you serious? What a mess of a site! What exactly are people supposed to do with this stuff? What are addition, rundown and subtraction numbers? It is amazing that some that is all of 25 years of age can claim to call something that she know nothing about a scam. I would go so far to doubt if you even know what a rundown consist of. I dealing with and playing he lottery before you was even born. In addition to that I have done over ten years of research in developing my system. How do you call a system scam that you have never seen. You have not purchase anything from me. Therefore, I know for a fact that you have seen my system to make or draw any conclusion about it. But we will wait until my books are published next year and we finish this discussion. Then we will allow the public judge and determine for themselves. I will at the point hold lectures and workshops for any of those that truly want to learn my system for themselves. Stay tune for the final word. Alright! Now, this is what I call a winner! Thank you for getting back to me, in a not so calm way. But that’s okay 🙂 Okay are you saying 25 years old shouldn’t be commenting on things that hit their nerves? Or are you saying 25 years old are still toddlers in the world of lottery? Clearly, your post needs to be edited, but I firmly believe that if a person is wrong, and when he knows he is wrong, he will explode – much like you did up here! So I’ll leave you to fantasize about what I know and what I don’t, clearly, it doesn’t matter to me 🙂 You said, “How do you call a system scam that you have never seen.” <<< That's exactly why I think it's scam. Why is there no LIVE proof on air to show that it’s not? You want people to buy your software only to repent later on? Why don't you step up and show the world what your software is all about? Why not come out live, pick a volunteer and let's see, let the whole world see your software works. Does this sound like a plan to you? Nevertheless, I am hoping you will invite me to your workshops and lectures and if it really does what it claims to do, then I'll post a note about it. Deal? I can smell scam so you'd better put your best move forward! I look forward to seeing more from you! Cheers! Thank you so much for that link, you stood by your words, so that’s impressive! What I’m happy about in the link is that you no longer have a dozen exclamation marks in one post :D! Here’s my question David, and trust me, no sarcasm, just pure innocence. 1. Why don’t they show a live preview of it? I mean how else can a person, even me, differentiate between scammers and non-scammers? 2. If the tool really works, why do they give it out to people instead of becoming filthy rich themselves? These questions often hit my mind when I come across lottery software and since you’ve been such a jolly good fellow, (no sarcasm!) and you’ve taken everything on a lighter vein, I’d request you to tell me 🙂 It would help me understand lottery software developers better! And he would also give the same lessons that he gave me before which he well know that is not what I paid him for. On the other hand if you knew h like I know him he would. So to Mr. Laster if at any time you say that I am lying , I can show you hundreds of emails that came directly from you to validate what I am saying and what his system is like and how Mr. Laster does business. After all, Why should he not take my money if I keep coming back. I will say this on his behalf, ..
Laster does know quite a bit regarding the lottery as far as the pick 3 lottery. We never went into the pick 4 almost not at all. From my experience his book only makes sense to him because he created it. So from him I was called stupid, quite a few times , and he also claims that his book is already worked out to play when looking up his numbers, well, THIS IS SO NOT TRUE. … TO THIS DAY FOR THE LIFE OF ME I CANNOT MAKE SENSE OF HIS BOOK AFTER TRYING HUNDREDS OF TIMES. I have lost a lot of money in conjunction with buying bogus lessons and playing tons of 10 sets of numbers a day…. I will admit that I should have left long ago and left him alone but, Mr Laster is very smart and has been doing this for many years I just think that I hung in at hopes of thinking that he would reward me for my commitment and finally help me in this game but I was wrong. He told me that he retired through many emails but from the postings from this thread I can see that it too was a lie. Good Luck to you all. God Bless.